Sundog Eyewear is constantly changing to provide products that fulfill its commitment to genuine performance in terms of outstanding value, impeccable styling, dependability and most importantly superior protection from the elements. The Sundog Eyewear approach to integrating different technologies in design and construction results in a higher state of quality that is both functional and innovative. Make the jump from a traditional process, based on 2D sketching, to a modern 3D modeling approach capturing all of the details of a production design. Use Altair Evolve to explore styling alternatives, visualize new products with realistic renderings and export the digital model. 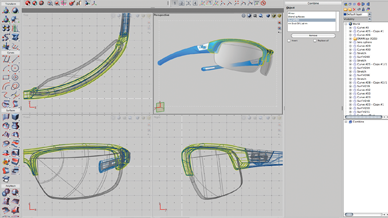 An Altair Evolve tool that provides an essential functionality for eyewear designs is the Stretch Tool. The tool allows the user to interact with complicated surfaces using a simple 2D approach. For example, it allows Michal to create a complex 3D surface and stretch it into a linear surface to easily apply precise trims for the final shape. It then allows Michal to re-apply the newly trimmed surface back into its 3D position. This allows Michal to integrate his 2D workflow into his 3D models, and enables him to work quickly and efficiently to create complex organic designs with the required precision. Among the features of Altair Evolve that assist in the development of new designs and increase Sundog’s productivity is the Altair Evolve ConstructionTree. This advanced construction history feature provides huge flexibility in modifying geometry throughout the entire modeling process. “The power of Altair Evolve comes when you want to explore a design a little further. I can go to edit parameter mode and move a point and change my geometry locally. It is a very organic way of modeling,” says Michal. 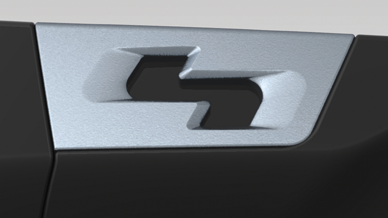 Rendering of Sundog Eyewear logo details on sunglass temple. 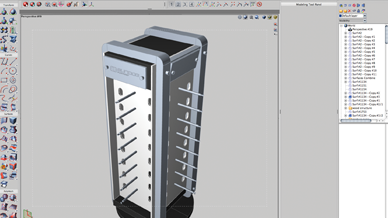 Sundog Eyewear display case designed in Altair Evolve. In business for over 30 years, Sundog Eyewear continues to provide its customers with genuine performance in eyewear comfort, protection and style. Regardless of what you do outdoors, you can be assured Sundog Eyewear will deliver exceptional performance in products that are genuine in their styling, workmanship and vision protection.